Case Shiller prices fell a record 19.1 per cent versus the previous year in Q1 2009. Mortgage delinquencies are at a record high 15.02 per cent (Q4 2009) according to the Mortgage Bankers Association — meaning an estimated 8.4 million families do not pay their most important bill. RealtyTrac reported a record of over 900,000 foreclosure repossessions in 2009, and estimates a record 3 million homes will experience a foreclosure event this year. First American counts 11.3 million homes with negative equity, and sees an additional 2.3 million homeowners on the edge of going overboard and under water. 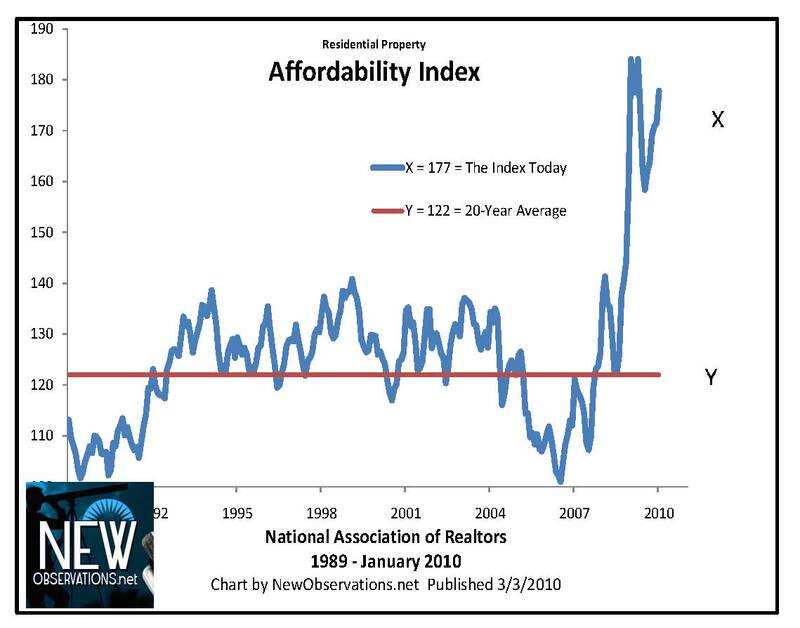 Mortgages rates hit a record low in 2009 on Freddie’s index for a 30-year fixed rate and the average 4.9% in Q4 2009 is outstanding for affordability (please see the chart above). The Fed won with low rates what Robert Shiller called in the Wall Street Journal “the most dramatic turnaround” he has seen in home-prices since starting to watch them in 1987. The year-over-year loss in values shrank last year from a monster 19% in Q1 to a mousy 2.5% in Q4. Fannie and Freddie now own the mother-of-all helocs. They can write themselves checks without consideration of their losses – an important fact given they will lose more money than anybody in the aftermath of the financial crisis. Only a fool fights the Fed. 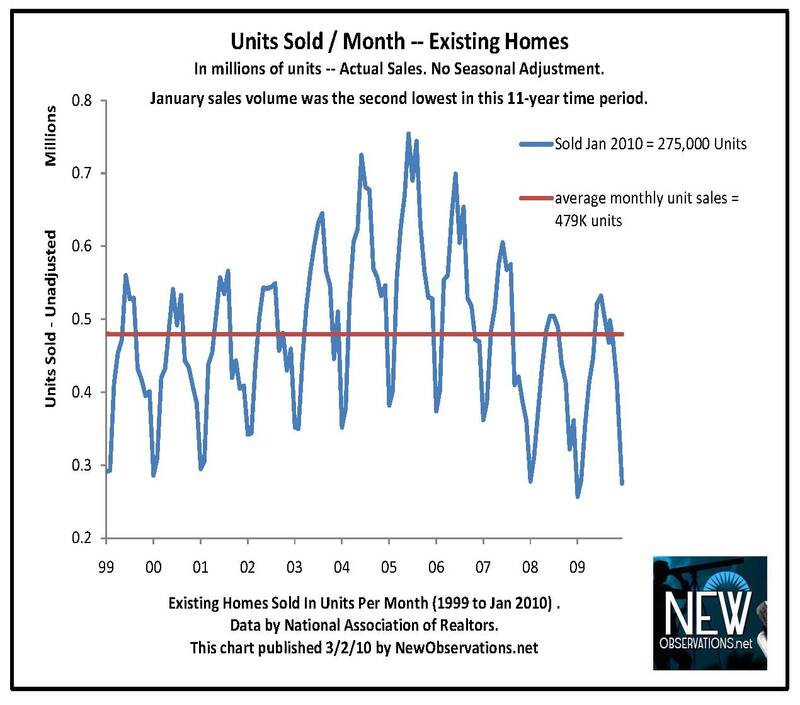 Yet the decline in unit sales in December 2009 of 16.2 per cent was the largest ever and the decline in unit sales in January 2010 of 7.2 per cent was the second largest ever and new home sales in January 2010 of 25,750 was the lowest on record. These record sales failures are not substantial except as a glimpse into a world without both free money for first time homebuyers and world-war-level government intervention to save a dying patient – the price of homes.